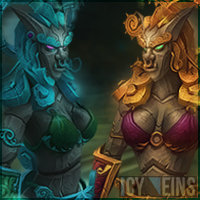 This guide is intended to provide a comprehensive description of the encounter with Twin Consorts in Throne of Thunder. It is targeted at anyone who desires to understand the fight mechanics. The Twin Consorts is the eleventh boss encounter in the Throne of Thunder. This fight, against two female Mogu, is slightly different from the usual twin fights, in that the bosses do not share health. The fight is quite healing-intensive, but more than that, it requires very good awareness and reactivity from all raid members. 10-man Heroic 314M 314M ?? ?M ??? The fight has a 10-minute hard enrage timer. Depending on your execution of the encounter, there may also be a soft enrage timer that causes the boss to take increased damage during the final phase of the fight. In addition to the items listed below, the Twin Consorts drop the tokens that you will need for buying your Tier 15 Head parts. 25-man with 18 DPS: 115k DPS. The fight against the Twin Consorts is a four-stage fight, during which you will fight Lu'lin and Suen, two bosses who do not share health pool. The Darkness Phase starts when you engage the bosses, and lasts for precisely 3 minutes. During this time, you will mostly be fighting Lu'lin, but Suen will sometimes appear for a few brief moments and cast spells at your raid. The Daylight Phase starts when the Darkness Phase ends, and also lasts 3 minutes. During this time, you will mostly be fighting Suen, but Lu'lin will sometimes appear and cast spells at your raid. The Break of Dusk Phase starts when the Daylight Phase ends, and lasts until one of the bosses is killed. During this phase, you will be fighting both bosses at once. Phase Four starts when either Lulin or Suen dies and lasts until the second boss is killed. Killing Suen first causes Phase Four to be a Darkness Phase. Killing Lu'lin first causes Phase Four to be a Daylight Phase. During the fight, your raid can receive aid from the four Celestials: Niuzao, Chi-Ji, Yu'lon, and Xuen. By having raid members perform certain unique tasks, you can summon the help of each of these Celestials, up to two times per fight. Each Celestial will provide a different temporary benefit to your raid. We have prepared the following video preview of the fight against the Twin Consorts, based on the testing from the Public Test Realms. Once we can do the fight on live realms, we will also publish an up-to-date video guide. We strongly recommend watching the video in order to get a better visual idea of the fight. The Darkness Phase begins when the bosses are engaged. Suen will disappear, and your raid will engage Lu'lin. Even so, Suen will sometimes re-appear to cast spells at your raid. The phase ends after 3 minutes. During this phase, Lu'lin will use several abilities. Moon Lotus is an ability that Lu'lin casts regularly during this phase. She places a lotus flower at a random location in the room (generally, it seems to be far from the center). For a very long time (possibly until the end of the fight), this flower sends out clouds in all directions, which move slowly. If players come in contact with these clouds, they are put to sleep (and essentially incapacitated) for 5 seconds. Cosmic Barrage is an ability that Lu'lin casts regularly. She channels the spell for a few seconds, spawning a number of stars on the floor. A few seconds later, each star chooses a random raid member and charges them, dealing damage in an 8-yard radius, and knocking any affected players back. It is important to note that this spell does not target melee players, probably assuming that there is a minimum number of players at range. Beast of Nightmares is spell that Lu'lin casts a few times during the Darkness Phase. She summons a Beast of Nightmares, a hostile NPC, which fixates on one of the tanks. Only the tank on whom this mob is fixated can damage and kill it. Each time the fixated player receives a heal, the healer who issued the heal receives a stack of a debuff called Corrupted Healing. Corrupted Healing is a stacking debuff that deals a moderate amount of damage every second. Suen also appears at times during this phase. She does not need to be tanked. She casts two abilities. Tears of the Sun is a channeled attack that deals raid-wide Fire damage every second. Light of Day is a nuke that Suen casts on random raid members, which deals damage in an 8-yard radius. During this phase, your raid must perform a few relatively simple tasks. Spread out, so that you do not take any additional damage from Cosmic Barrage and Light of Day. Avoid the clouds released by the Moon Lotus created by Lu'lin. They move slowly, so avoiding them is not hard. Have which ever tank is not focused by a Beast of Nightmares tank the boss. Have the tank that is focused by the Beast of Nightmares DPS and kill it. Healers must keep this tank alive with as few heals as possible, so as to minimise the amount of damage that they take from Corrupted Healing. It is worth noting that you can apply DoTs to Suen when she appears to cast Tears of the Sun. The Daylight Phase begins after the Darkness Phase ends (so, 3 minutes into the fight). During this phase you will mostly be fighting Suen, but Lu'lin will also sometimes appear for brief moments. The phase ends after 3 minutes. During this phase, Suen will use several abilities. Fan of Flames is a stacking debuff that Suen casts on the current target, necessitating a tank switch. Each stack increases Fire damage taken by 25%. Flames of Passion is an ability that Suen regularly casts during this phase. She effectively charges a random raid member, dealing damage in a small area around them, and knocking back any affected players. On her way back to the tank, she leaves a very damaging trail of fire in her path. Blazing Radiance is a stacking self-buff that Suen applies on herself all throughout the phase. Each stack increases her Fire damage done. The stacks of this buff can be reduced through one of the abilities that Lu'lin casts during this phase, which we talk about below. Suen continues to use Light of Day during this phase, which works just like it does in the Darkness Phase. Lu'lin appears several times throughout the phase. She is only present momentarily, during which time she casts an ability against your raid. She does not need to be tanked. Every 20 seconds, Lu'lin casts Ice Comet against your raid. Several projectiles land on a raid member's location, dealing damage to any targets they hit. After the effect is complete, a hostile NPC called Ice Comet is left behind. If Suen is near to the Ice Comet, she slowly loses stacks of her Blazing Radiance over time. As this is happening, her heat also melts the Ice Comet, slowly damaging it until eventually the Comet dies. The closer Suen is to the comet, the faster it melts. Players who stand next to the Ice Comet are considered to be hiding in its shadow, and they benefit from a buff called Icy Shadows, which greatly reduces Fire damage taken, but also reduces attack and casting speed slightly. Raid members can attack, damage, and kill the Ice Comet. Finally, even though the Lotus Flowers spawned by Lu'lin during the Darkness Phase as part of her Moon Lotus ability will still be around, they do not do anything during this phase. This phase is considerably more difficult than the Darkness Phase. Your raid will have to keep Suen's stacks of Blazing Radiance very low, by having her tanked next to an Ice Comet for as much of the phase as possible. The boss will still have stacks of Blazing Radiance at certain points in the phase, though, because the Comets are not always present, and because she sometimes charges distant raid members through Flames of Passion, moving away from the comet, so her damage done will be quite high. It is possible (and, indeed, recommended) that players who are targeted by Ice Comet move from that location, so as to avoid getting hit by the projectiles. Tanks also have to alternate tanking Suen, since she stacks the Fan of Flames debuff on her current target. The tank currently tanking Suen should try to benefit from the Icy Shadows buff, by standing in it. The Break of Dusk Phase begins after the Daylight Phase ends (so, 6 minutes into the fight). During this phase you will be fighting both Lu'lin and Suen at the same time. The phase goes on until one of the two bosses is killed. During this phase, both Lu'lin and Suen are active. We will discuss which abilities each of them possesses during this phase (note that they retain some of their previous abilities, and Lu'lin also gains a new one). During this Phase, Lu'lin will not use Moon Lotus anymore, and any Lotus Flowers that are around will be harmless. She will also not use Beast of Nightmares or Cosmic Barrage anymore. She will, however, continue to cast Ice Comet. In addition to this, Lu'lin gains a new ability. Tidal Force is a channeled spell that Lu'lin uses often. While channeling it, she sends out waves of water in many directions. These waves deal high damage to any players that they hit. While channeling this spell, Lu'lin deflects all spells cast against her, and also dodges all attacks, effectively becoming immune to damage. Suen will no longer use Fan of Flames or Flames of Passion during this phase, nor does she use Tears of the Sun. She will continue to stack Blazing Radiance on herself during this phase, as well as casting Light of Day on raid members. Since this phase ends when one of the two bosses is killed, it is your raid's goal to kill one of the bosses as quickly as possible. Given the fact that Lu'lin is immune to damage for considerable portions of the phase, you should focus your efforts entirely on Suen. This is a good idea also because a fourth phase where you have to fight Lu'lin is easier than one where you have to fight Suen. Your raid should be spread out (to minimise damage from Light of Day. You should continue to have Suen tanked next to the Ice Comets, to reduce her stacks of Blazing Radiance. The greatest difficulty in this phase comes from the very damaging and very difficult to avoid Tidal Force cast by Lu'lin. The waves move quite quickly, so raid members will have to quite reactive in order to avoid them. Since avoiding them will often prove difficult, if not impossible, you should try to have every one of them covered by some kind of defensive cooldown (such as Rallying Cry or Devotion Aura). When one of the two bosses is killed during the Break of Dusk Phase, you will enter the phase associated with the remaining boss. That is to say, if you kill Suen, you will enter a final Darkness Phase, and if you kill Lu'lin, you will enter a final Daylight Phase. Regardless of which phase you enter, you will remain in that phase until you kill the last remaining boss. Should you kill Suen first, and enter a final Darkness Phase, you should not find this phase problematic. The raid damage is considerably lower than in the first Darkness Phase, since Suen no longer appears to cast Tears of the Sun and Light of Day at your raid. All of Lu'lin's abilities from the previous Darkness Phase will still be used, but at this point of the fight, your greatest concern will most likely be the 10-minute enrage timer. Should you kill Lu'lin first, and enter a final Daylight Phase, you will find that this phase is quite difficult. The difficulty comes from the fact that with Lu'lin dead, no more Ice Comets will appear, and, thus, you will have no way of removing Suen's stacks of Blazing Radiance. You will just have to make use of defensive and healing cooldowns, as well as any offensive cooldowns you have left, in order to kill Suen as quickly as possible. Note also that the enrage timer of the fight will be bearing down on you. Close to the walls of the room, there are four short pillars, and on top of each of them there is a projection of one of the four Celestials. Raid members can click the pillars, and if they successfully complete the task that they are given, the Celestial projected on the respective pillar will grant aid to your raid. You can receive help from each Celestial a maximum of two times per fight. More specifically, their cooldowns reset when you enter the Break of Dusk Phase, so if you had used them before that, you will be able to use them once again. The Tiger's Celerity, granted by Xuen, which causes the majority of boss abilities and effects to be slowed down, rendering them more easily avoidable. When a player clicks one of the Celestials' pillars, they are teleported to another dimension. They are still in the room where your raid fights the Twin Consorts, but they are now alone. Above their head will appear a marking (for example, the letter W). On the floor of the room, there will be a collection of stars. In order to call upon the Celestial for aid, the raid member must re-create the marking above their character by connecting the stars on the floor to form an identical pattern. Connecting the stars is done by simply walking over them. You can imagine that your character is a pen, and the floor is a sheet of paper. When the task is successfully completed, the raid member will be taken back out to the rest of the raid. Make sure to check our video preview of the fight to see what activating a Celestial looks like. There are two things to consider when choosing how to use the Celestials. The Break of Dusk Phase is by far the most strenuous one from a healing and survival perspective, so you want to make sure that you use the Fortitude of the Ox and the Tiger's Celerity during this phase to help you stay alive. The faster Suen dies, the easier the fight is, so you want to make sure to do as much damage to her as possible. This means that you should aim at using A Rush of Cranes once during The Daylight Phase, and then once again during The Break of Dusk Phase. As such, our first recommendation is that you use A Rush of Cranes and Serpent's Vitality during The Daylight Phase, preferably not quite at the end of the phase. This will restore your healers' mana in preparation for The Break of Dusk Phase, and will also give you enough time for the cranes to damage Suen (the cranes do their damage over a rather long period of time, so you need to account for this). Our second recommendation is to then use all 4 Celestials during the Break of Dusk Phase. You can probably afford to have no Celestial up for the first Tidal Force, since everyone in the raid should be more or less topped off, so you can start with A Rush of Cranes. For the second Tidal Force, you should aim to have Fortitude of the Ox up, ensuring that your raid members will survive. You can then activate Serpent's Vitality again, to restore some health and mana for your raid before finally timing The Tiger's Celerity in such a way as to coincide with the next Tidal Force cast (making the waves easy to avoid). We recommend using Heroism/ Bloodlust/ Time Warp during the Break of Dusk Phase. This is due to the fact that this phase is by far the most difficult one in the fight, and it is imperative to get out of it as quickly as possible by killing one of the bosses. Until the Break of Dusk Phase, your progress through the fight depends solely on whether or not you can survive (phases end after 3 minutes). Therefore, to get accustomed to the first two phases, your raid can sacrifice a few attempts during which the goal is to survive and not deal damage. During the Darkness Phase, the real issue will be the Beast of Nightmares. The healers need to get used to casting only their best single-target heals on the tank who is currently targeted by the beast. During the Daylight Phase, the main task falls on the tanks who have to keep Suen close to the comets in order to remove her stacks of Blazing Radiance. During the Break of Dusk Phase, the raid will need to become adept at avoiding damage from Tidal Force. The Heroic mode of Twin Consorts does not differ much from the Normal Mode, but it is quite a difficult encounter nonetheless. Below, we will present you the differences between the Normal and Heroic versions, and then explain the ideal strategy. Both bosses have increased health and deal increased damage. In addition to this, each boss gains a new ability in their respective phases (Lu'lin gains a new ability in the Darkness Phase, and Suen gains one in the Daylight Phase). Lu'lin's new ability creates a number of adds called Lurkers in the Night. These adds are invisible by default, and they deal damage to random raid members. The only way to reveal these adds (allowing you to attack and kill them) is to have Suen move over their location while she is channeling Tears of the Sun. As you can tell, all of this refers to the Darkness Phase. At the end of Darkness Phase, all the adds become visible. It is worth noting that, once visible, the adds have normal threat tables and they do not melee for very much. Suen's new ability is called Nuclear Inferno. This is a spell that Suen channels for 8 seconds every 60 seconds, during the Daylight and the Break of Dusk phases. It deals a high amount of raid-wide Fire damage every second, and while channeling this spell, Suen is practically immune to damage (her spell deflection and chance to dodge are increased by 100%). There are two components to the strategy for this Heroic mode. The first deals with how your raid should handle the Heroic-only mechanics, while the second has to do with certain changes to the Normal mode strategy, mostly due to the very intense tuning of the Heroic mode. To handle the Lurkers in the Night, the intended method is to move Suen around when she is channeling Tears of the Sun, so that the Lurkers in the Night are revealed and so that your raid can attack them. Remember that Suen moves quickly and freely while she is channeling the spell, following the person on whom she is fixated. That said, however, revealing these adds during the Darkness Phase is not really necessary, since their damage is quite low overall, and your time is better spent doing damage to the bosses instead. You should see how well your particular raid group can handle the damage that these adds put out before deciding whether or not to reveal the adds. A good time to AoE and kill the adds is at the end of the Darkness Phase, when they all become visible. Even better, you can finish them off while Suen is casting Nuclear Inferno, since you cannot damage her then so you are not wasting any DPS. Nuclear Inferno is extremely damaging, but you can reduce a large amount of the damage that it deals by being close to an Ice Comet while Suen is channeling the spell (the Icy Shadows buff you gain when near a comet reduces Fire damage taken by 60%). Other than this, you should simply make sure that there is ample healing going out on the raid during this time. As in Normal mode, you will want to kill Suen first (in the Break of Dusk Phase), and you will want to have the Break of Dusk Phase last as little time as possible. In order to do this, you will have to deal as much damage as possible to Suen during the Darkness Phase. This means that whenever Suen appears to channel Tears of the Sun, you should have everyone switch to her and apply DoTs and bleeds, as well as doing as much damage as possible. Ideally, Suen should be below 90% health when the Darkness Phase ends. During the Daylight Phase, you will have to deal as much damage as possible to Suen, including using Heroism/ Bloodlust/ Time Warp and the A Rush of Cranes buff granted by Chi-Ji. Finally, in the Break of Dusk Phase, you will have to focus Suen first, only attacking Lu'lin during Nuclear Inferno. Other than using Chi-Ji's buff during the Daylight Phase, as we mentioned above, there are a few other recommended uses for the Celestials. Use Xuen's The Tiger's Celerity to allow your players to avoid the damage from a Cosmic Barrage during the Darkness Phase. Use Fortitude of the Ox at the end of the Darkness Phase, to ease the transition to the Daylight Phase (all the Lurkers in the Night will appear at once). Ideally, you can catch the final Cosmic Barrage of the Darkness Phase with the buff up. Use Serpent's Vitality during one of the Nuclear Infernos in the Daylight Phase. Use Xuen's buff again about 15-20 seconds into the Break of Dusk Phase, so that you can avoid being hit by the first Tidal Force. Use the remaining 3 buffs at any point during the Break of Dusk Phase. This concludes our raid guide for the Twin Consorts. We hope you have found it helpful. Please do not hesitate to post any feedback you may have on our forums. 12 Jun. 2013: Added Heroic mode. 26 Mar. 2013: Improved many explanations of abilities and strategy recommendations; added suggestion that tanks should try to benefit from the Icy Shadows buff; greatly expanded the recommended use of Celestials section. 24 Mar. 2013: Updated health values; added mention of 10-minute enrage timer; improved some explanations and recommendations; added DPS requirements. 22 Mar. 2013: Remove Elixir of the Jade Moon, which never made it to live.